CT can provide valuable information before corrective surgery. This is mainly performed when a deformed spine disables the patient. 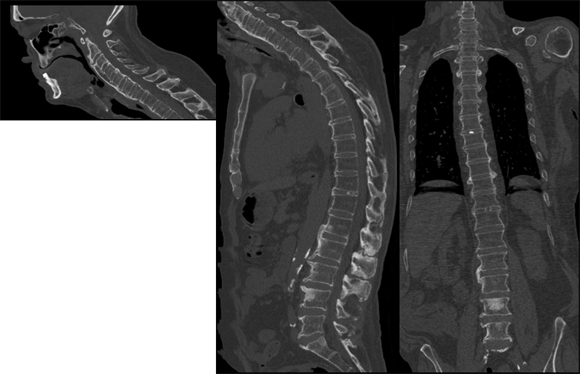 The images show 2D CT reconstructions of a patient with ankylosing spondylitis. Sagittal (left) and coronal (right) reconstructions show deformation in the sagittal plane with ankylosis of the cervical and thoracic vertebral bodies. There is also ankylosis of the upper lumbar vertebral bodies, but not corresponding to the lower lumbar vertebral bodies.